For years, traditional spinning disk technology reigned as the only option for enterprise storage. While the speed and performance of other infrastructure components improved exponentially, hard drive technology has improved only incrementally with performance remaining largely the same since the year 2000 when the first 15K RPM drives were released. Traditional hard drive storage has been, and remains, a common bottleneck, making otherwise powerful IT systems sluggish and inadequate for handling the demands of modern workloads. As the cost decreases and capacity increases, flash technology has steadily been making inroads into the enterprise storage architecture, to the point where flash has become a standard component of most storage solutions. While hybrid flash configurations remain a popular and affordable option, more and more organizations are looking for even higher performing solutions and considering integrating all-flash arrays into their storage architecture. They’re doing this for one simple reason: The performance of all-flash storage arrays is vastly superior to that of traditional hard drive arrays. With all-flash, latencies can be slashed, from milliseconds to microseconds. The performance demands of modern enterprise workloads are only increasing while at the same time the densities of these workloads are dramatically increasing. Virtual infrastructures—both virtual servers and virtual desktops – are common. With virtual desktops, traditional storage arrays can cause a significant lag in response time especially during the morning boot process, which is unacceptable to users. How many times have you gone for a cup of coffee in the morning after you power on your machine because you know you have an extended wait time? As IT teams look to fit ever-increasing numbers of virtual machines on the same physical hosts, they see all-flash as a superior solution over purchasing more and more traditional hard drives to compensate for the performance shortfall. Highly-transactional and time sensitive workloads are also steering IT directors in the direction of all-flash. Whether it be the need to perform financial analytics or drug research or even simply to support ERP workloads supporting the business, companies need to enable rapid and in some cases immediate access to their data; delays or slow response times can result in lost profitability and customers looking elsewhere for their information and their products. To put it in broad terms, any application in which every transaction creates value for a business can be made significantly more efficient with an all-flash storage array. The more efficient the environment is, the more workload it can handle—the more business value it can generate. 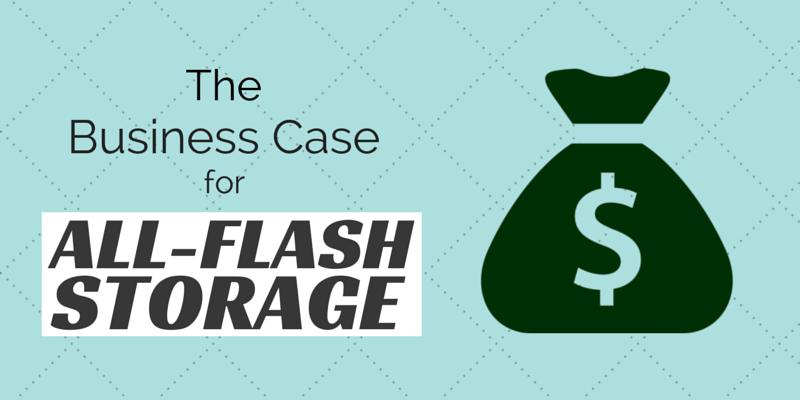 Despite its performance benefits, the clear downside of all-flash storage has been cost. On a strict price-per-terabyte basis, traditional spinning-disk hard drives are far more affordable than flash. However, price-per-terabyte isn’t the only way to measure the cost of enterprise storage. On a price-per-IOP basis (IOPS meaning input/output operations per second), all-flash often gains the advantage. Plus, flash takes up less space and requires less energy to power and cool than traditional storage. The answer is yes—especially when the all-flash solution takes advantage of two powerful data reduction techniques, inline deduplication and compression. Inline deduplication and compression make all-flash an economical solution for accelerating demanding workloads by maximizing the effective capacity of an all-flash array, minimizing writes, and extending its lifespan. In some cases, we are seeing all-flash array solutions which either highly competitive with or even more cost effective than traditional storage arrays. Is there a cost-effective way to accelerate our workloads with the power of an all-flash array? How do they do this and can all-flash storage with inline deduplication and compression help you achieve your performance goals? Learn more in our free white paper, “Making All-Flash a Reality: How to Bring the Power of All-Flash Storage Down to Earth.” Download this new white paper by clicking on the image below.